The hijackers of a Sudanese plane flown to Libya have freed all 95 passengers on board but are still holding the crew, Libyan officials say. The Sun Air Boeing 737 was seized shortly after taking off from the Darfur town of Nyala on Tuesday. 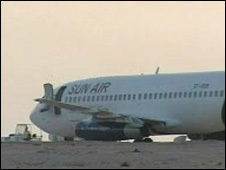 The pilot had said that some passengers had fainted after the air-conditioning failed in Libya's desert town of Kufra. He said the hijackers - who had asked for fuel to fly to France - were Darfur rebels but this has been denied. "All of the passengers have left the plane," a Libyan official told the AFP news agency from Kufra airport. "The two hijackers and seven crew are still inside. We are continuing to negotiate with them," he said. The BBC's Rana Jawad in Tripoli says video footage on Libya's state-run television showed the released passengers in the airport lounge looking relieved but tired. They described the ordeal as "very distressing". They said there were two hijackers, armed with pistols. Some Libyan officials have said there were 10, or more. Sudan has demanded that Libya extradite the hijackers. The plane was on its way to the Sudanese capital, Khartoum, on Tuesday, when a man with a knife hijacked it, a Sudanese security official was quoted as saying by the Associated Press news agency. The plane initially tried to land in Cairo, Egypt, where it was denied permission to land. Sudanese officials say the hijackers belong to one of the numerous rebel groups fighting in Darfur. The director of the Kufra airport told the Libyan news agency Jana that the hijackers had told the pilot they were from the rebel Sudanese Liberation Army of Abdel Wahid Mohammed Nur. Mr Nur, who is based in Paris, has strongly denied any involvement in the hijacking. "We categorically deny the responsibility of our movement in this hijacking operation," he told al-Jazeera television. "We don't support putting the lives of Sudanese civilians at risk in any circumstances." Three members of a different SLA faction, led by Minni Minawi, were aboard the plane. A spokesman for this faction, the only one to sign a 2006 peace deal with the government, has also denied any involvement in the hijacking. A five-year conflict in Darfur has left about 200,000 people dead and more than two million homeless. The desert oasis of Kufra is in a remote region approximately 1,700km (1,050 miles) south of the Libyan capital, Tripoli. It is an area close to both the Sudanese and Chadian borders, and is often used as a corridor for humanitarian aid for displaced Darfuri refugees in Chad, as well as a transit point into the country by illegal immigrants, says the BBC's Rana Jawad, in Tripoli.